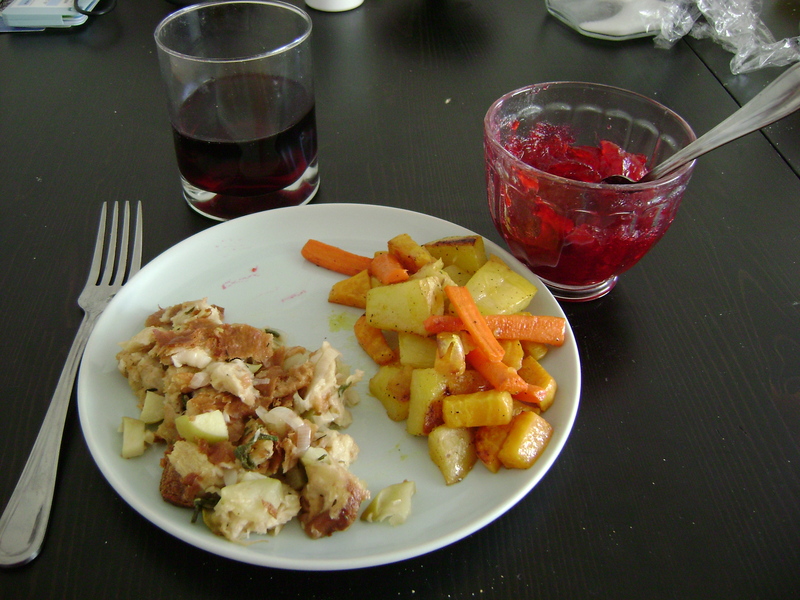 The Main Meal: Since there is only one of me, I decided on a relatively simple main meal: Roasted veggies, challah-apple stuffing, and cranberry sauce. All of this was served with a Beaujolais (an excellent holiday wine, as its light, easily drinkable, and goes well with food). Roasted veggies are super easy. I went with a pretty golden-themed root veggies, but you can roast nearly anything. Chop up 1 golden beet (fairly small), a yellow yukon potato, and two carrots. Toss in salt, pepper and olive oil. Spread on a baking sheet and roast at 400 until they are all tender. While still hot, put the cooked veggies into a bowl and toss with some white wine vinegar. One piece of advice – beets often take longer to cook than potatoes or carrots, so chop them smaller – that way everything will be done at the same time. Traditionally, and also within my family, stuffing is made with cornbread, and includes things like celery. I dislike cornbread and celery. This year, however, was special, because it was Thanksgivukkah! The start of Hanukkah and Thanksgiving coincided this year, creating the new holiday of Thanksgivukkah. Which means new and exciting foods! My best friend sent me a list of Thanksgivukkah foods, and one immediately made it onto my list of things to cook for Thankgivukkah: Challah-apple stuffing. Not that I used their recipe – I made a few improvements. Chop a 1/4 loaf of challah into roughly 1 inch pieces, and stick them in a bowl. Mince 3 cloves of garlic and slice 1 small leek (the white parts). Melt a couple tablespoons of butter in a frying pan, then add the garlic and leeks. Saute a bit, then add one green apple, chopped, 8-10 sage leaves, chopped, and 2 pinches of dried thyme. Saute all together until done. Add the mix to the challah, then add 1 cup of vegetable broth. Mix it all together, than pack into a baking dish – I used my two mini-loaf pans. Bake at 400 for about 20 min, or until lightly brown on top. Cranberry sauce: Bring 1/2 water to boil. Add 6 tablespoons of sugar and 1 cup fresh cranberries. Cook, stirring occasionally, until it has thickened and looks/tastes good, about 15 minutes. Dessert: For dessert was one of my all-time favorite things ever – Apple pie! I mastered apple pies for Thanksgiving when I was eight, and have made them for the family (or myself) every year since then. However, the recipe is my secret, so you will simply have to muddle through without it. Sorry – but a girl’s gotta have some secrets.